Seeing their captain make a late, lung-bursting run into the penalty area before calmly slotting the ball past the goalkeeper isn’t something Liverpool fans are accustomed to these days. But on Friday night that is exactly what happened as the Reds returned to the summit of the Premier League. It was never really Steven Gerrard’s forte though he did have it in his locker during the earlier years of his career. Since Jordan Henderson took the armband off the legendary No.8, he’s been deployed primarily as a holding midfielder tasked with setting the tempo. It wasn’t always the way. 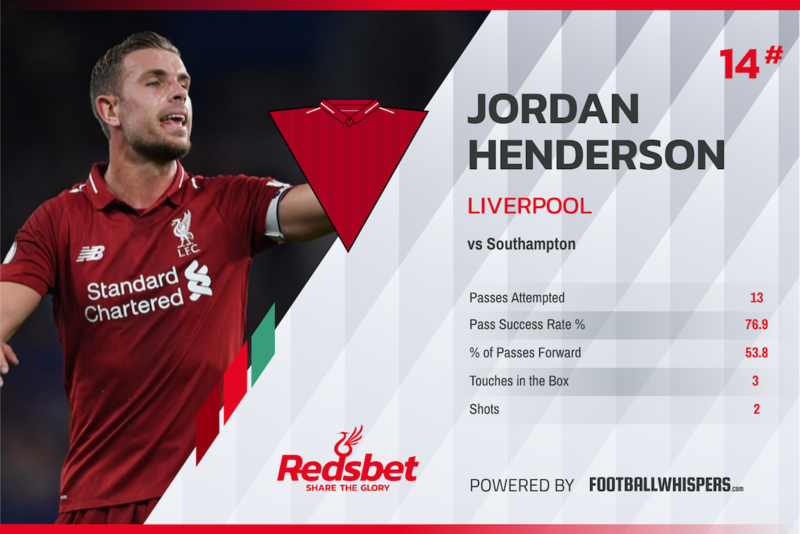 And against Southampton, Henderson rolled back the years in what was a man-of-the-match cameo as Liverpool leapfrogged Manchester City into top spot after coming from behind at St Mary’s. Henderson was unshackled from the deeper role he’s been married to for the best part of five seasons. No doubt frustrated after starting the game on the bench, Henderson was unleashed with 30 minutes to play and the scoreline reading 1-1. Replacing Gini Wijnaldum on the right of the midfield three, the Liverpool skipper was told by Jurgen Klopp to “make a difference”, and he did just that. With Fabinho sitting as the deepest midfielder, the former Sunderland box-to-box midfielder was free to impact the game in the final third, just as he did during the 2013/14 campaign. Henderson is usually the one Klopp turns to when he wants the game to be controlled. Here he turned to his captain to ramp up the tempo. He looked right at home doing just that. Speaking afterwards, Henderson revealed what the Liverpool boss wanted: “To our (along with James Milner) experience and then make a difference. Help the lads, get them going because we were under a bit of pressure. Henderson’s high energy in the Southampton half helped Liverpool smother the home side. They suffocated them and it was more of a question of when and not if those in purple would find a winner on the night. The Liverpool No.14 was credited with an assist for Mohamed Salah’s stunning goal. After Sadio Mane blocked a James Ward-Prowse effort, Henderson expertly guided a header into the path of the Egyptian. The rest, as they say, is history. His off the movement created opportunities for others. He was running the channels and popping up around the edge of the penalty area with great regularity. On average this season in the Premier League, he touches the ball 1.16 times in the opposition’s penalty area, against the Saints, during his 30-minute cameo, he managed three. Similarly, with shots, Henderson’s averaged 0.69 per 90 this season but had two against Ralph Hasenhuttl’s side. Perhaps the most eye-opening stat from the match was the percentage of Henderson’s passes played forward. When deployed in the deeper role he usually receives the ball facing his own goal and, given he’s not the most press resistant player, he either passes sideways or backwards. However, on Friday, in a more advanced position, he was picking the ball up on the half-turn and it allowed him to play it forward. He finished the game having played 53.8 per cent of his passes forward. His season average is 24.1 per cent. Henderson looked comfortable in this role. He was thriving as the free midfielder tasked with supporting the attack. He gave the Reds something they’ve lacked in a number of games this season – a runner from midfield. Now, it would be naive to base the argument that the Liverpool captain should be permanently moved to more of a box-to-box role off the back of one match. Especially when the match was one the Reds had to win and therefore took more risks than usual. But there will be more teams like Southampton during the run in. Teams who are ok with the Reds having sterile possession in the middle third. Teams who will look to block up the passing angles into the front three. And during these games, the supply from wide areas might be erratic with Andy Robertson and Trent Alexander-Arnold having an off day. It’s during these games that Henderson could be the man to help turn a draw into a win. His selfless running is an effective tool when it comes to stretching the opposition and that threat alone create opportunities. It happened on Friday, with Liverpool carving out two shooting opportunities after Henderson made dashes into dangerous areas. The running like a crazy devil role is perfect for the captain. And it’s a tactic teams won’t be ready for.